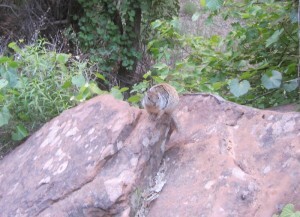 This is another in a series of articles by Kelly Monaghan and Sally Scanlon about Zion National Park. Other articles include: Exploring Zion National Park, Along Kolob Terrace Road, Traveling Along the Zion-Mt. 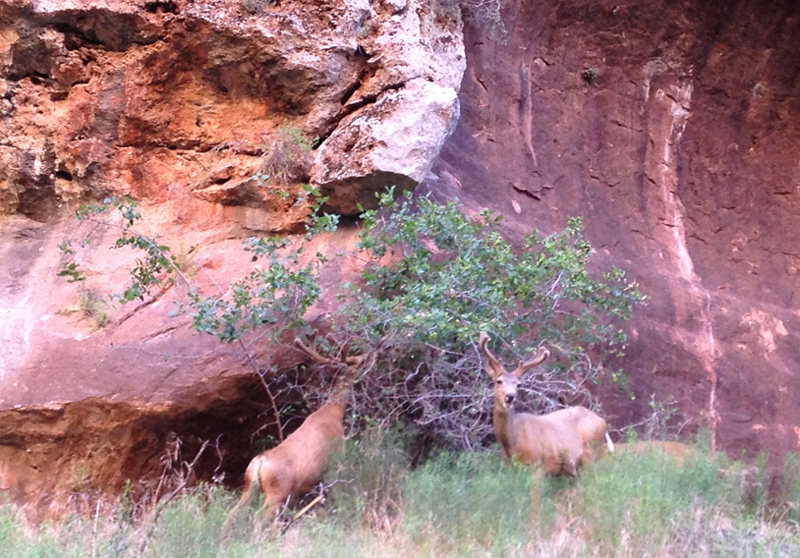 Carmel Highway, and Exploring Kolob Canyons. First stop: The lanes where you pay your entrance fee ($25 per passenger vehicle in summer 2014 and $12 for pedestrians) and pick up your glossy full-color park map and very useful newspaper-style guide. Your entrance pass is good for seven days. Older adults get a great break: $10 for a lifetime national park pass if you can prove you are 60 or older. You need only one pass per private vehicle. Most entry and exit lanes moved surprisingly quickly on the three mid-June days we visited. Next stop: The parking lot if you’re visiting April through October. Use of canyon shuttle buses is mandatory and included in your admission. The parking lot has special sections for RVs and other oversize vehicles. 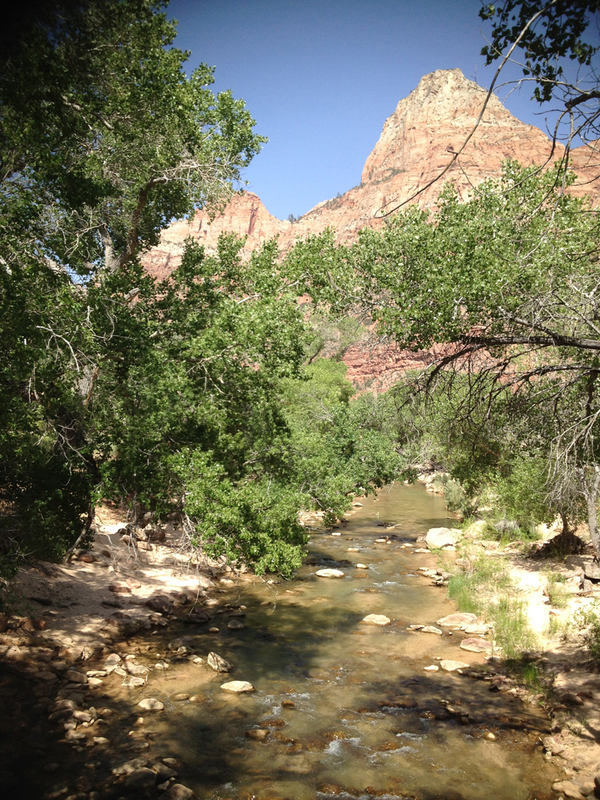 Onsite campers and guests of Zion Lodge can drive to their respective sites by showing the required permit. 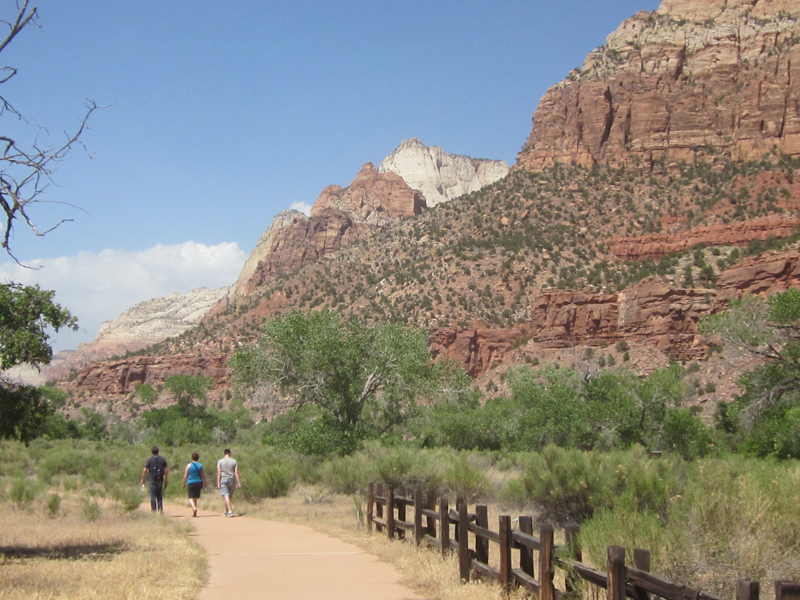 As noted above, Zion offers free shuttle service between Springdale and the park. Shuttles run from early morning to around sunset. Zion Canyon, the 229-square-mile park’s biggest draw, boasts 13 trails, ranging from 0.4 to 9.4 miles in length round trip and in difficulty from “easy” to “moderate” to “strenuous.” We chose to skip the “strenuous” trails, among them the hike to Angel’s Landing, one of the park’s most popular (and thus crowded by mid-morning). Instead we explored several “easy,” “easy-moderate,” and “moderate” trails. By far the easiest is the Pa’rus Trail, a 1.7-mile walk (one way) on a paved path between the Visitor Center and the second stop on the up-canyon shuttle. Walking south toward the Visitor Center, you can stop at the park’s Human History Museum (the shuttle’s first up-canyon stop). It screens a film about the park and its geology as well as some background on the indigenous populations, early explorers, the Mormon settlers who named the area Zion (because it promised them a peaceful life after persecution elsewhere), and the area’s 1909 designation as a national park by President William Taft. The Pa’rus is the only trail in the park that’s open to bicycles and pets; the latter must be on a leash less than 6 feet long. Virgin River from Pa’rus Trail. 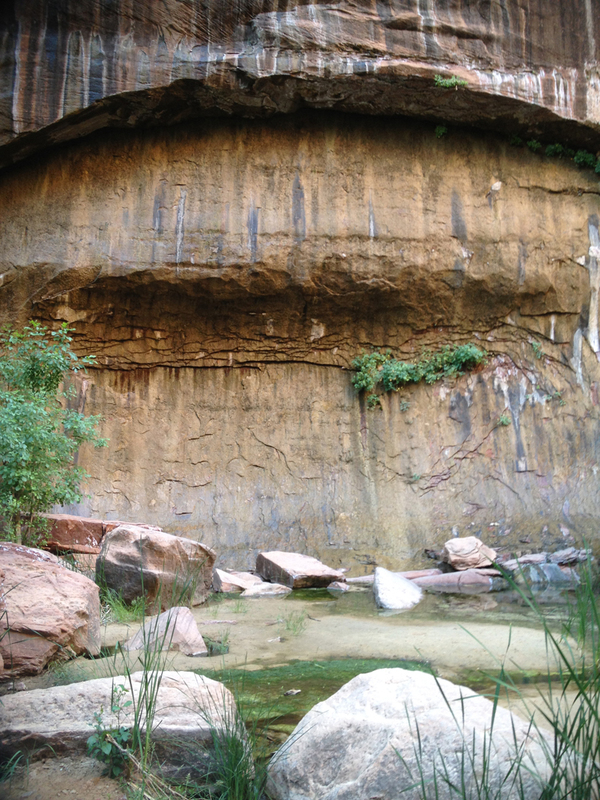 Truth to tell, the trail segment from the Museum past the South Campground to the Visitor Center isn’t particularly interesting in itself, but it provides views of both the Virgin River, the area’s life-giving waterway, and the canyon’s stunning sandstone walls. Park rangers say it also offers an especially lovely view of the walls at sunset. 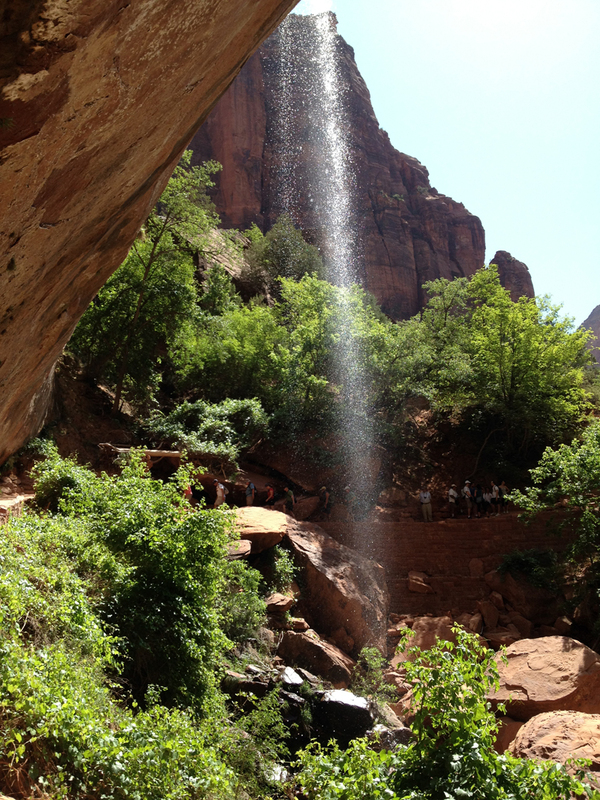 The waterfall at lower Emerald Pool. The trail to the lower Emerald Pool from Zion Lodge (the fifth of eight up-canyon shuttle stops) is an easy walk of well under two miles round trip on a paved path. It provides views of the river, vegetation, cliff walls, waterfalls that vary from wispy to spectacular depending on the season and rainfall, and the eponymous pool, as well as access to the river from several points for those wanting closer views or a chance to wade. The path was crowded in midafternoon, but appealing nonetheless. Hanging gardens along Riverside Walk. 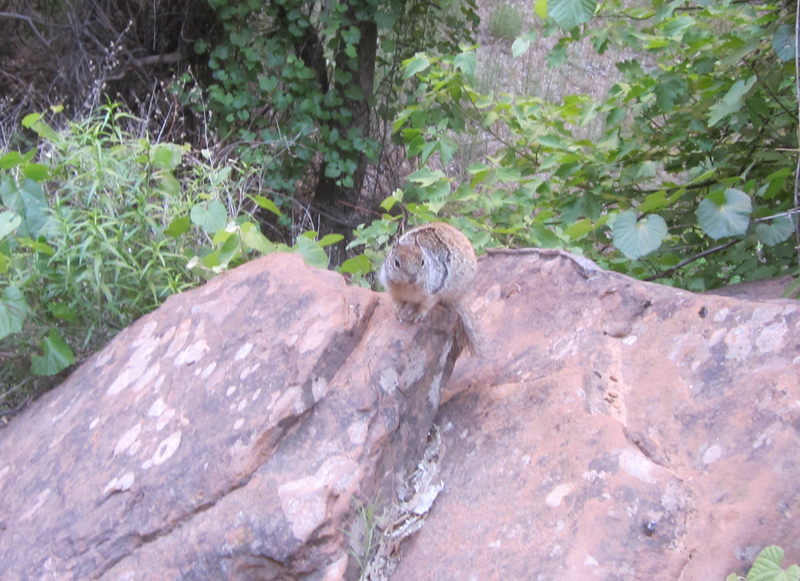 Rock squirrel at Riverside Walk. The easy and very popular two-mile round trip Riverside Walk begins at the Temple of Sinawava, last stop for the up-canyon shuttle. An early-morning start put us ahead of the crowds. Bird song filled the forest. The river ran below us. Lizards and a rock squirrel scuttled near the path and interpretive signs offered information about the many varieties of plants growing beside the trail. Best of all, as we turned a corner, we spotted three young mule deer bucks relaxing in the high vegetation beside the trail, the intensely colored canyon wall providing a spectacular backdrop. The trio seemed unbothered by the humans who stopped to photograph them. They were still there, and grazing, when we passed by an hour later on our return. Mule deer graze beside Riverside Walk. Riverside Walk ends at the river. 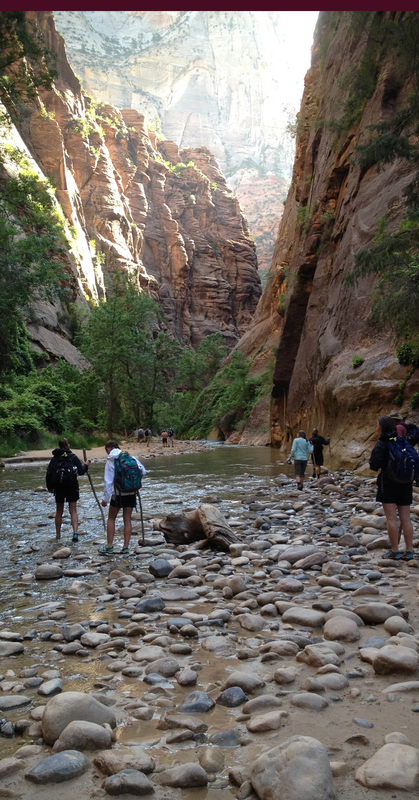 From there, the more intrepid can hike The Narrows, a 9.4-mile, moderate-strenuous “trail” through the Virgin River into the upper reaches of Zion Canyon, where the walls narrow to just 20 feet apart in some places. Signs warn Narrows’ hikers to equip themselves with a hiking stick, hard-toed shoes, and a fleece or windbreaker (among other things) and to be prepared to swim in places. Returnees we met later said it was a wonderful experience. 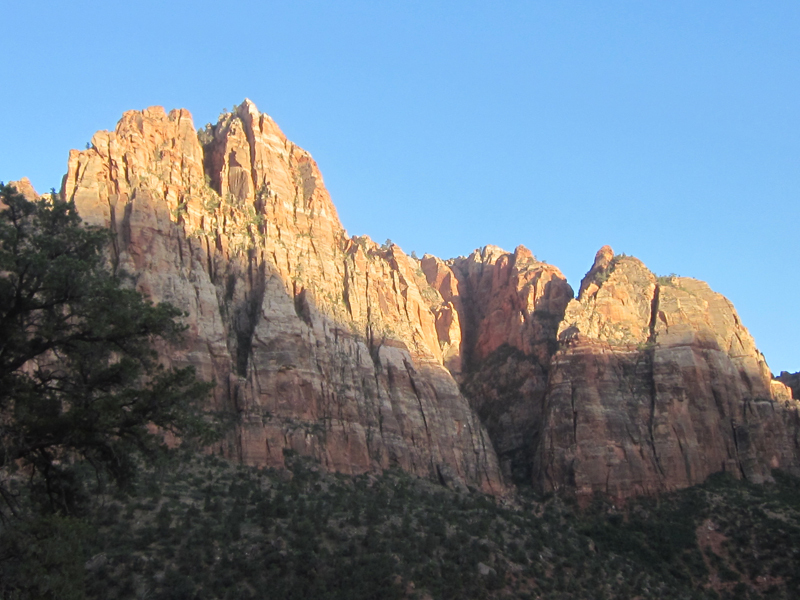 The canyon walls at sunset from the Watchman Trail. 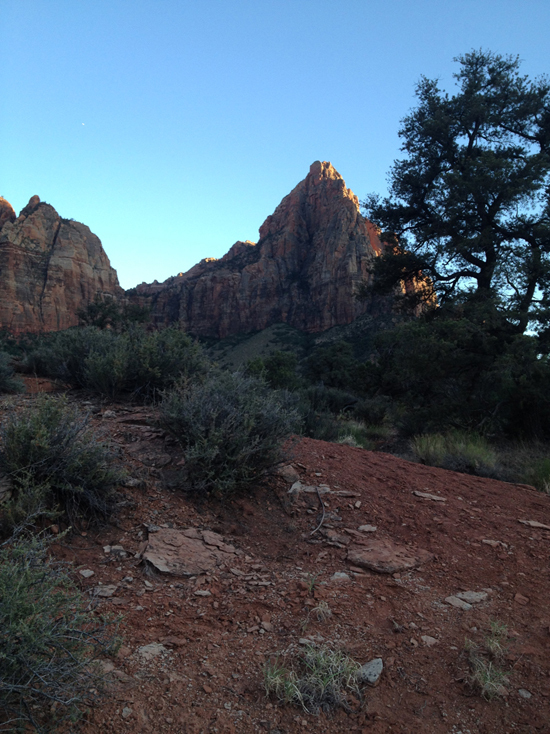 We hit the steep, “moderate,” 2.7-mile round trip Watchman Trail an hour or so before sunset. The trail, which starts near the visitor center and the river, climbs rapidly in a series of switchbacks. The 0.9-mile loop at its end, high above the canyon floor, offers views into the far distance. We watched the last rays of sunlight climb the canyon walls to the top of the Watchman formation before heading back down in the dimming light. Tip: If you plan to linger much past sunset, bring a flashlight to ensure a safe return hike. It’s a long way down if you should fall from the trail. Another view of the Watchman at sunset.